The Insatiable Critic: Audiobook spotlight: The Idiot Girls' Action-Adventure Club: Where do I sign up? Audiobook spotlight: The Idiot Girls' Action-Adventure Club: Where do I sign up? I have to admit, when I first picked up this book, I was skeptical. 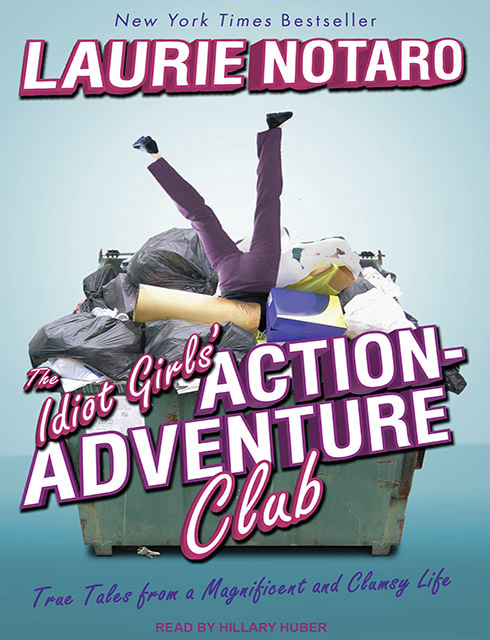 The title - The Idiot Girls' Action-Adventure Club: True Tales from a Magnificent and Clumsy Life, gave me visions of a Sweet Valley High book only grown-up and with (more) alcohol. But as I started listening, it revealed itself to be a series of hilarious comic essays about the young adulthood of the author, born in Brooklyn and replanted in the hot dusty landscape of Phoenix, Arizona. I have to give the narrator, Hillary Huber, major props on this book. The expressive quality of the writing begs to be read aloud, and Ms. Huber does so – with gusto. As Notaro writes about everything from being mistaken for a homeless person on her way to jury duty to helping her friend get back home after passing out face-down in a stranger’s desert landscape lawn, Huber uses her magical powers of vocal diction and variety to make those passages even funnier. For instance, Huber chose to give Notaro’s three-pack-a-day mother from Brooklyn a husky, Fran Drescher voice (minus the laugh, not to scare away any potential listeners), whereas her grandmother and her grandfather are given slightly softer accents. It also helps that Huber happened to be born in NYC, so she has the attitude as well as accent. I would liken this book to a box of dark chocolate truffles: even if you listen or read only one chapter at a time, it’s still sweet, satisfying, and just the tiniest bit of the actual bitterness of life thrown in there. Absorbing the whole thing in one listen might be a little much. But what I most love about this book is that the author is not perfect. She is almost self-deprecating, and yet in almost every tough situation she faces, she manages to get the upper hand and accept herself for what she is – an imperfect person. In a world where women are told to eat this, not that, fitness is based around dress sizes rather than actual health charts, and magazines and websites tell us to pluck, dye, wax and shave ourselves into perfection; it is good to have a comedic voice cut through it all and tell us that it is okay to accept, and sometimes even embrace, our imperfections. This is not high-brow writing requiring a deep sense of intellect, but it has a helluva lot of heart, and for me that carries its own merit. Though this book is clearly geared toward women, men will definitely get a good laugh at it too. Notaro is not a man hater by any respect, and this is not intended as some kind of rant about female empowerment – it’s just life. And though life does have its share of tragedy, Notaro reminds us with her wink-and-smile writing style that even at the lowest of the low moments, life is also a whole lot of fun if you want it to be. For more Laurie Notaro goodness, visit her website here.